NESCA News & Notes: Soccer and the Brain - Heading for Trouble? What a game! Where else do people use their heads to bounce balls going 100 kilometers/hour? As you might expect, 50-80% of soccer injuries affect the feet and legs. However, the American Academy of Pediatrics concluded that the contact that occurs while playing soccer is at the same level as in boxing, football, ice hockey, lacrosse, rodeo, wrestling and field hockey. A study involving men's and women's college soccer teams from the Atlantic Coast Conference found a total of 29 concussions in a 2-year period. The most common cause of the concussions was when one player's head struck the head of another player. This was also the most common source of concussions in a group of soccer players at the US Olympic Sport Festival in 1993. The second most common cause of concussions occurred when a ball struck a player's head. These head-to-ball concussions happened when a player was hit in the head by a ball kicked from close range. In many cases, the ball traveled so quickly the player did not have time to react. NONE of the concussions were caused by proper heading of the ball. Soccer players also seem to perform more poorly than control subjects on some types of IQ tests and many former players (81%) suffer from problems with attention, concentration, and memory. Players who typically head the ball have also been found to have more neurological problems than non-headers. Compared to goalies and midfielders ("non-headers"), forwards and defenders ("headers") performed more poorly on some memory, visual perception and planning tests. Heading of the ball may have caused the neurological problems reported in soccer players. However, it is possible that other types of head injury were responsible for these injuries. For example, many professional soccer players suffer head injuries when they collide with other players or hit the ground. 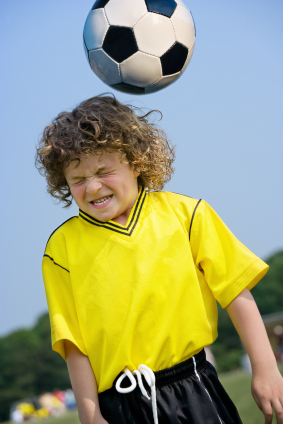 Therefore, soccer-related brain injury may not necessarily be due to heading the ball. On the other hand, it is unknown if repeated low intensity impacts, like those that occur when the ball is headed, make players more susceptible to later impacts. Most of the data come from players at the elite level who have played soccer for many years. Professional soccer players head the ball thousands of times during their careers. There has not been much research on the effects of heading the soccer ball on children or recreational players. Although helmets may protect players from concussions, their usefulness has not been tested. At least one company is selling helmets to be used by children while playing. There are very few soccer-related deaths. However, the U,S, Centers for Disease Control reported that 18 people between 1979 and 1993 had been killed by falling goalposts. Of these 18 people, 14 had head injuries and most were children who were climbing on unstable goalposts, not playing soccer. Eric Chudler, Ph.D. is a neuroscientist (Research Associate Professor) at the University of Washington, and Executive Director of the Center for Sensorimotor Neural Engineering in Seattle. He is a "basic researcher" whose experiments relate to how the nervous system works, and how Parkinson's disease affects the brain. His post-doctoral training took place at the National Institutes of Health in Washington, D.C. He was also an instructor in the Dept. of Neurosurgery at Mass. General Hospital. i would love for anyone to contact me to state what treatments they would offer for someone who had increased sleep hours, irregular sleep patterns, and increased sensitivity to light and noises. would prozac be the only treatment option or would it make the fatigue worse as well as add on additional suicide attempt factors to all ages. i believe occupational therapies, as well as increased nutrition during increased sleep hours would be more beneficial anyone agree?